The Sunshine Coast’s newest restaurant and bar is now officially open, just in time for festive celebrations. 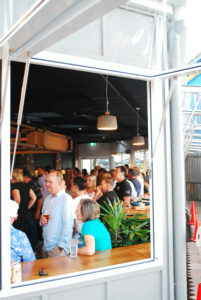 The Dock Mooloolaba is the latest restaurant to open as part of The Wharf Mooloolaba’s revitalisation. The Dock Mooloolaba specialises in smoked meat, char-grill and has 52 beer taps across three different bars, the most on the Sunshine Coast. The offering includes 16 different varieties on tap, with a further 20 available on cans as well as a quality selection of wine. The Wharf co-owner Dirk Long from Evans Long said it was exciting to see the difference in the precinct over the last few weeks. “Just in the last two weeks we have seen the opening of Saltwater Fish and Chippery, Rice Boi and now The Dock Mooloolaba and it is really exciting to see the transformation of the precinct,” Mr Long said. “The Wharf is bustling with people again – which is exactly what we wanted to achieve when we purchased the property in April 2016,” Mr Long said. Restaurateur, Jared Hart, who also owns Melbourne’s oldest pub, Captain Melville and Loch n Key Bar, said they opened the restaurant quietly for the weekend ahead of the official opening today. “This project has been more than a year in the making for us and it has been amazing to see the way the Coast community has embraced us already. “We are focused on delivering great food as well as a top-quality selection of beer and wine – showcasing the best the region has on offer as well as bringing in some of Australia’s best selections. Mr Long said The Dock Mooloolaba is the largest of the new restaurants at 500m2, catering for over 300 people so it is also offers a much-needed offering for functions. 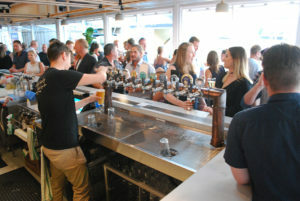 “It really is a great venue and complements the other restaurants at The Wharf including See Restaurant, Chances, Hogs Breath Café, The Wharf Tavern and Tony Kelly’s Saltwater and Rice Boi,” Mr Long said. “Mooloolaba used to have The Wharf as one of the great pinnacles and now we are getting back to that,” Mr Long said. Mr Long said work on the 10-million revitalisation of The Wharf would now pause over Christmas when there would be some great family activities available including arcade games from air hockey through to adrenaline fueled car and superbike racing, giant Jenga and Connect Four in the courtyard with giant bean bags to form a chill out zone. “On weekends, we will also have live music as well as a petting zoo,” he said. For more information and the Summer activities program visit www.wharfmooloolaba.com.au. Mr Hart said he would now split his time between the Sunshine Coast and Melbourne. Jared said about 60 consultants, traddies and construction crew worked to make the restaurant a reality, with about 40 new full-time, part-time and casuals now employed at the restaurant. For details when they become available follow The Dock Mooloolaba on social media. To find out more about The Dock Mooloolaba follow them on Facebook and Instagram @thedockmooloolaba and visit www.thedockmooloolaba.com where you can also book online.